Every other day, I do a 'bread run'. None of this pre-packaged bread for me, only the 'proper' stuff. So it was today, on a heavily overcast morning, with the hint of much needed rain, that I did my run. I always take my camera with me, and do a drive round the Bellerive waterfront, hoping for a possible photo op.. 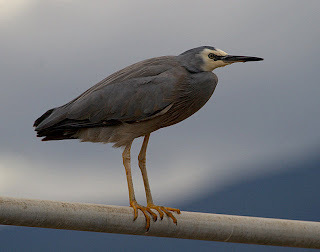 Nothing much about, even the usual gulls seemed absent, but I caught sight of a White-faced Heron, standing on the railing of the yacht club's pier. So out I get, and took a few shots, albeit in less than perfect conditions, but you have to take your opportunities. As I crept ever closer, I was suddenly aware of a commotion in the water beyond the jetty. A pod of around 20 Common Dolphin, obviously chasing fish, were passing, some only a few metres fro m the shore. I was a bit torn at this stage! Realising that I am rarely present at these dolphin moments, I opted to 'shoot' the dolphins, and ignore the heron. Well it soon became apparent that to take any meaningful shots would need better reflexes than I've got! Lots of shots of dorsal fins, not much else, save for a single shot of a dolphin leaping, taken by pure chance, as it was just beyond others that I was targetting! I, and a number of other bystanders, were given a great display, as the pod moved into Kangaroo Bay. I suspect their prey was probably Black-backed Salmon, but that's only an educated guess. In minutes they turned back into the Derwent River, still chasing fish, paralleling the shore for a few hundred metres and then out into deeper water. A great sight and a great adjunct to my 'bread run'. 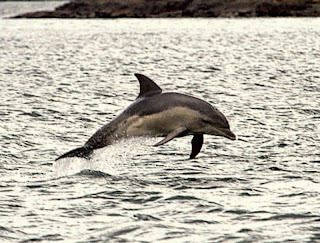 wow, Bill - well done on getting a photo of the dolphin leaping. I have tried several times to capture this, but always just get bits of dorsal fin. As I mentioned in the blurb, they were generally too quick for me, and this shot was really a fluke. Yes, I too got lots of pix of dorsal fins. I do wish it hadn't been so overcast, would have improved the images. BTW, I'm actually called Alan, but I've been called worse than Bill,apologies to all the Bills out there!